Each year we await for our ratings in the James Halliday Wine Companion, the wine rating bible in the Australian wine world. It is a great way to get ratings year on year for a benchmarking assignment for your own wines as well as others. The Moorabool Valley region has a collection of highly rated wineries and wines. The Moorabool Valley has a large collection of 5 Red Star wineries - Outstanding winery regularly producing wines of exemplary quality and typicity. Will have at least two wines rated at 95 points or above, and had a five-star rating for the previous two years. 282 wineries, 10%. The Moorabool Valley is an 'emerging region' even though it has a history of being one of the earliest grape growing regions in Australia. Those in the 'wine-know' will have been purchasing wines from here for many years however we are seeing a surge in the knowledge of this region with everyone and people are discovering the quality of the wines in particular Chardonnay, Pinot Noir and Shiraz. Wine Companion on Austins & Co.
Pamela and Richard Austin have quietly built their business from a tiny base, and it has flourished. The vineyard has been progressively extended to over 60ha. Son Scott (with a varied but successful career outside the wine industry) took over management and ownership in 2008. The quality of the wines is admirable. Exports to the UK, Canada, Hong Kong, Japan and China. First an understanding of what the ratings mean. 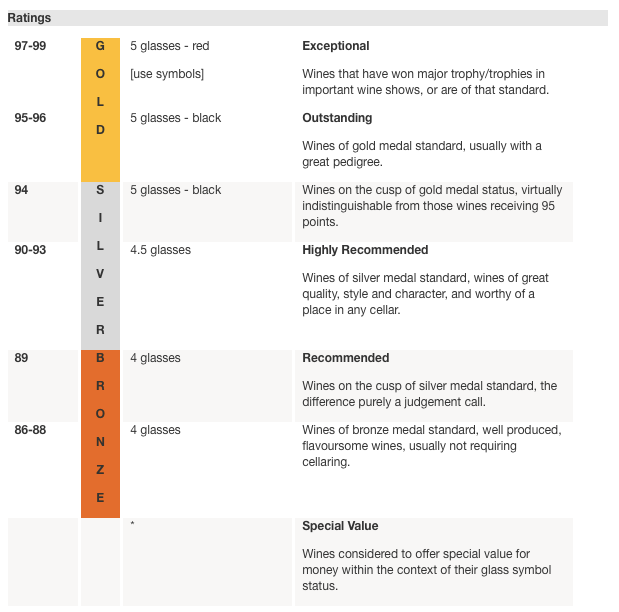 10 wines with special value status. Details are here, please note that many of these wines are not yet released and some have sold out. We will be notifying our e-news members when they will be released, if you aren't signed up to our newsletter you can do so here. Named after the first grandchild of Pam and Richard Austin, Ellyse is made only in the best vintages. Hand-picked, gently pressed, fermented in French oak, a barrel selection made after 9 months. This is an exceptionally good chardonnay with a special clarity of expression, and even greater intensity and drive to its classic fusion of white peach, nectarine and pink grapefruit. Given its balance and wealth of fruit expression, it has no need for active French oak support, but course, it was barrel-fermented. provide balance and mid-palate vinosity. Complexity is a given, as is the length of the palate. The grapes are largely destemmed but not crushed, a warm ferment initiated with wild yeast, finishing with cultured yeast, matured in old puncheons for 9 months. A complex and compelling pinot with more savoury whole bunch characters than the vinification would suggest, characters that make the wine so satisfying, for there is a wealth of juicy red fruits that run right through to the finish. The highest quality fruit selected, hand-picked and further sorted in the winery, wild-fermented in a 3-tonne open fermenter, matured for 15 months in a thick-staved 500ml puncheon and an 800l concrete egg. The deep crimson-purple hue stands out; a full-bodied wine of ultimate complexity, intensity and balance; blackberry, cracked black pepper, spices and licorice soar across the bouquet and palate. The puncheon has contributed an identifiable addition of cedar, that of the egg working with texture not flavour. Hand-picked, destemmed, open-fermented, 15% whole bunches, matured in mostly used French oak for 12 months. Has the extreme power of its 6ft6 sibling, but polishes the raw edges with the help of the whole bunch inclusion and the quality of the fruit selection. If you are looking for otherwise and balance to provide a full-bodied shiraz that can be drunk now, the spicy elements and fractionally softer tannins of this wine should do the trick. Austins and Co. Geelong 19yo vines, hand-picked, whole bunch-pressed, wild-fermented in French oak (30% new), matured on lees for 10 months. A complex, rich, multilayered chardonnay with a full suite of stone fruit flavours balanced by citrussy acidity on its long and satisfying palate. Has the X-factor that 6ft6 lacks. The clear, bright colour introduces a bouquet with notes of spice and forest floor woven through the lively and long palate with plum, red cherry and sour cherry fruits liberally doused with spices. Austins and Co. 6Ft6 Geelong Pinot Noir Rose20169213.5Screwcap17/03/17Estate-grown, early harvested, lightly pressed wild-fermented, matured on lees for 5 months. A rose that was 90% made in the vineyard, and all the better for that, dancing with bells and strawberry/spicy fruits as it travels through the palate. The aftertaste seals the deal. A rich, intensely flavoured full-bodied wine that takes cool climate shiraz into another dimension. Wonderfully spicy, its black-berried fruit flavours link with licorice and cracked pepper, the end result an unexpected freshness and elegance. Warm grown shiraz can be wonderful, but will always be different to cool grown. crimson-purple; a full-bodied cool climate shiraz; savoury/tarry edges come from the fruit, not the tannins per se. Blackberry and licorice fruit will provide the engine for prolonged cellaring. Deeper colour than some of its siblings; a solid pinot with depth and length to its array of cherry and plum flavours. It has clear varietal expression, but that's it. Fresh, crisp, bright and minerally, with a subtext of lime zest and green apple. You can't do more in this region, and the wine will grow in bottle. No frills vinification, machined-harvested at night, free-run juice cool-fermented in tank. The depth of the varietal character is well above average with pear, stone fruit and citrus all competing for the front row of the long palate. A savoury pinot from a low-yielding vintage (poor flowering) that is intense and long, with a boney element looking for flesh that simply wasn't there in the first place. This unusual blend benefits greatly from its region of origin and its improbable synergy. The result is a wine with considerable power, citrus its foundation stone. No frills winemaking, machine-harvested at night, pressed quickly, cooled juice settled for cool fermentation and early bottling. A wine with attitude, and an unexpected savoury visage. If you would like to purchase any of the above, contact us to see if there is any stock available.